Fleetwash has a classic family business story, with the extra-humble beginnings and all. But there’s no getting around the fact that this truck washing and facility service company has grown, taken on investors and generally changed shape over time. With 1,500-some employees across a national footprint and 700 trucks on the road daily, it’s more of a corporation than a family business now. Yet, it’s the feel of a family business that the company’s leaders still aspire to, according to Jerry DiGiovanni, vice president of sales and facility services and the son of the company’s founder. “We’ve continued to treat our company like a tightly-knit, family-run unit, which means holding onto what made us great in the first place,” he said. That means a number of things to Fairfield-based Fleetwash’s leadership, including valuing safety and offering high-quality service to local communities. There’s another way it keeps a family connection — and that’s in the branches that have been added to the Fleetwash family tree. Anthony DiGiovanni, Fleetwash’s chief operating officer and Jerry’s brother, said that has come through the 85 smaller shops that the company acquired between the mid-’80s and today. “People are not only still here from our first acquisitions, but they have children and other relatives working here now, too,” Anthony DiGiovanni said. DiGiovanni pointed to the example of a local manager, who has two sons employed in top operations positions in Pennsylvania and Virginia, as well as a nephew, who runs the company’s largest facility in the country, one based in Los Angeles. There are many similar stories that could be told of personnel added to the coast-to-coast business, a veritable empire that was started with a makeshift truck washing operation. The company would eventually develop a patented system that also would be deployed in the different lines of business that were later added to Fleetwash’s portfolio, such as power-washing sidewalks as well as facilities. These other lines of business were seen as a great opportunity for Fleetwash to use its equipment at times when all of its customers’ trucks were on the road, DiGiovanni said. The company has taken on a wide array of services that go well beyond cleaning off dirtied fleet trucks. It has attracted high-profile retail companies such as Target in the process. Last year, Fleetwash brought in $92 million in revenue, about $66 million of which was still from the company’s truck washing side. The context behind that figure is important, too — it makes Fleetwash by far the industry’s leader. The company’s largest competitor, in comparison, likely did less than $20 million last year, DiGiovanni said. “But just because we’re the largest in this industry doesn’t mean it’s not competitive,” DiGiovanni said. 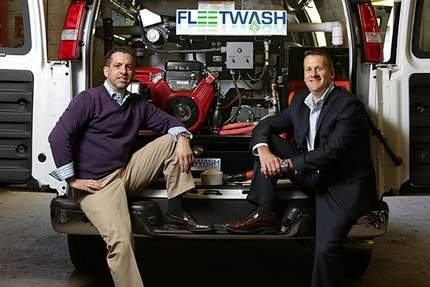 “We’re competing against thousands of companies, including the mom-and-pop shop that simply goes to Home Depot and puts a washer in the back of their truck.” DiGiovanni said the goal at Fleetwash is to hit $100 million in revenue.